The novel Authority by Jeff VanderMeer is the second book of the Southern Reach Trilogy. My commentary on the first of the series, Annihilation, is here. Though in many ways less compelling than the first novel in the series, this is a very creative book that takes all sorts of chances as it goes into unexpected directions. Where Annihilation was an atmospheric mix of science fiction and psychological horror, this book takes off in a completely different direction, as it is essentially a quirky science fiction based character study with healthy doses of humor in terms of tone and style. Area X is a large swath of land that is mysteriously isolated by an invisible barrier, where bizarre, terrifying and deadly events take place. This story takes place almost entirely outside of this area and concerns itself with the government organization, called Southern Reach, tasked with investigating the strange phenomena. The main character is the new director of Southern Reach, a man nicknamed “Control.” As Control digs into the very bizarre phenomena of Area X, he discovers that the psychological effects that plague visitors to the area are beginning to affect Southern Reach personnel. As the story develops, the borders of Area X begin to expand and envelope Southern Reach headquarters. Taking place shortly after the events of the first book, much of the narrative concerns itself with the interactions between Control and a duplicate of The Biologist, the main character from the first book. Somehow, a copy of the Biologist has been produced and has returned from Area X. The copied women is now known as "Ghost Bird”. Control finds that he is very drawn to Ghost Bird’s fascinating character and background. VanderMeer is a very different writer who breaks rules. His uniqueness as an author is illustrated as he portrays this attraction in a nonromantic and nonsexual way. Thus avoiding an obvious cliché and forgoing a path that most others writers would have taken. Another testament to VanderMeer’s quality as a writer is that, for one chapter and in a few other segments, the narrative veers in to the atmospheric psychological, science fiction and horror mix that characterized the previous book. He then elegantly transitions back out of this style. Control is one of the more interesting and well-crafted characters that I have encountered in literature. On the surface, he is a new high-powered leader of a super serious and secret organization. His background is in dealing with terrorists and other national security threats, but when his inner self is revealed, he is shown to be a man wracked with insecurities and self-doubt. He also has a wry and ironic sense of humor. His relationship with his mother, also a government operative, as well as that with his deceased father, is examined in detail over the course of the narrative. "A vision of his couch in his new home, of Chorry curled up on his lap, of music playing, of a book in hand. A better place than here." Annihilation left a long series of unanswered questions and strange mysteries as to the nature of Area X and the operation of Southern Reach. Slowly, through the course of the narrative, some, but not all, of these blanks are filled in. "Because more and more in the modern Internet era you came across isolated instances of a mind virus or worm: brains that self-washed, bathed in received ideologies that came down from on high, ideologies that could remain dormant or hidden for years, silent as death until they struck." This book goes off in a completely different from the first in in the series terms of style, and it is still be successful as a testament to VanderMeer’s creativity and skill as a writer. Though a science fiction character study with strains of satire leaves us with a book that is a little less of a page-turner than the atmospheric psychological horror of the first novel, this book is a worthy piece of writing in its own right. This novel does not work as standalone work, as it presupposes that the reader is familiar with the events of Annihilation. As an artistic and unique example of speculative fiction that is part of a larger whole, it is a very worthwhile sequel. I will be moving ahead to read the third and final book in the trilogy, Acceptance, right away. 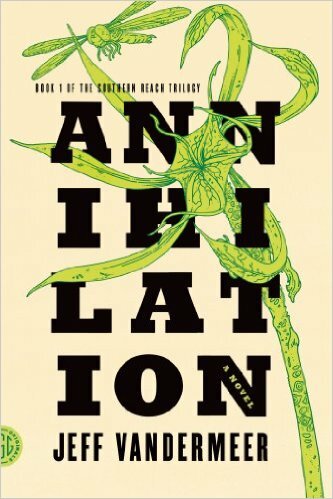 The novel Annihilation by Jeff VanderMeer is the first book of the Southern Reach Trilogy. It won the 2014 Nebula Award for Best Novel. This book is strikingly good. It is original, has compelling characters and themes, is well written, is imbued with atmosphere and is at times genuinely scary. The plot revolves around a fictional part of Florida known as Area X. Thirty years before the main events in the novel, some kind of event took place here. Though officially it was designated an environmental catastrophe and placed off limits to the public, it becomes clear that something much odder, bizarre and profound happened and continues to manifest itself in this area. Among many strange phenomena, an invisible barrier surrounds the zone. All who cross the barrier disappear. There is only a single “breach” that allows exploration teams to enter or exit. Over the years, multiple teams have entered the zone. Many met with various calamities, including the suicides of all team members, murderous insanity, mental degradation, team members returning with terminal cancer, etc. 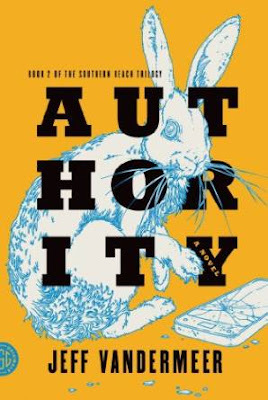 “Southern Reach” is the secret and possibly malevolent government agency that is investigating the phenomenon. This novel centers on the latest expedition, which is comprised of four women. The team members are known only by their titles. The story is told in the first person by the team member known only as the Biologist. After the team enters the zone, all sorts of bizarre occurrences begin to happen. Personality changes of the team members begin to manifest themselves, and strange structures with even stranger interiors and beings are discovered, just to name just a few plot developments. Almost everything about this novel is uncanny. It is one of the most atmospheric books that I have ever read. The closest comparison that I can make is to the works of H.P. Lovecraft. The events, even by science fiction and horror standards, are unusual but believable. The prose consists of matter-of-fact descriptions that, when added together, paradoxically give the book a dreamlike feel. The feeling is that of a disquieting dream that is, at any moment, about to cross into a nightmare. Little is revealed about the characters or situation at the novel’s start, but much is slowly divulged over the course of the narrative. There are many surprises and revelations along the way. Through flashbacks and background information, the Biologist is revealed as a complex and very well drawn out character. She is a loner who has trouble in relationships and social situations. I could devote an entire post to her. I read some interviews with VanderMeer that assisted me in figuring out some underlying themes here. There is a strong pro-environmental message, and this book is in part a warning about the dangers of climate change. This gets worked into the plot in a very strange way. There is also a great deal of complex philosophy at play here. The book seems to be questioning many assumptions and thought systems that people cling to. Furthermore, it seems to be saying that many of these belief systems are imposed by outside agencies. It seems to highlight the fact that much of what we accept as truth is illusionary. This is illustrated in the passage below. In one of the book’s many flashbacks, the Biologist is describing her husband’s experience with nightmares. "Part of my husband’s life had been defined by nightmares he’d had as a child. These debilitating experiences had sent him to a psychiatrist. They involved a house and a basement and the awful crimes that had occurred there. But the psychiatrist had ruled out suppressed memory, and he was left at the end with just trying to draw the poison by keeping a diary about them. Then, as an adult at university, a few months before he’d joined the navy, he had gone to a classic film festival … and there, up on the big screen, my future husband had seen his nightmares acted out. It was only then that he realized the television set must have been left on at some point when he was only a couple of years old, with that horror movie playing. The splinter in his mind, never fully dislodged, disintegrated into nothing. He said that was the moment he knew he was free, that it was from then on that he left behind the shadows of his childhood … because it had all been an illusion, a fake, a forgery, a scrawling across his mind that had falsely made him go in one direction when he had been meant to go in another. " It turns out that what everyone assumed was the cause of these bad dreams was incorrect, and an entire model was built around the fallacy. When this fallacy was removed, it led to freedom and relief. There are also allusions to the fact that knowledge and belief systems are often so complex that they are unknowable. No matter how we try, we really cannot understand the nature of certain aspects of reality. "At a certain point, I discovered I was so overwhelmed I could not continue, could not even go through the motions. It was too much data, served up in too anecdotal a form. I could search those pages for years and perhaps never uncover the right secrets, while caught in a loop of wondering how long this place had existed, who had first left their journals here, why others had followed suit until it had become as inexorable as a long-ingrained ritual. By what impulse, what shared fatalism? All I really thought I knew was that the journals from certain expeditions and certain individual expedition members were missing, that the record was incomplete." In addition to there being missing journals, it is described in other passages how many of the journals are rotted, insect eaten, water damaged, etc. It seems that the above is symbolic of complex truths that people try to grapple with and understand. The author may be saying that we are confronted with a barrage of what is random information in no discernable order. Relevant information is often missed, missing and inaccessible. The emotional despair in such quests for knowledge seems overwhelming. There are so many more allusions to the elusiveness of truth and the illusions that people cling to in the narrative throughout this novel. For instance, the Biologist discovers that the team members have been hypnotized and that they have had all sorts of false beliefs implanted in their minds. I should emphasize that my above summary is an oversimplification of the philosophy that the author is attempting to explore. I do believe that VanderMeer is on to something and that people often do accept invalid belief systems and build entire worlds around them. Furthermore, truth often is elusive, and we live in a really complicated universe where people, history, culture, science, etc. often do not yield easy answers. With that, I believe that people can formulate valid belief systems as well as discover scientific truths. Thus, I would not go as far as VanderMeer. This is a fantastic novel. It is incredibly atmospheric and genuinely spooky. It is gripping and left me enthralled wanting to discover the secrets of Area X. The Biologist is an interesting, imperfect and well-crafted charter. The themes are intricate and thought provoking. I highly recommend this book to folks who are interested in science fiction as well as psychological horror. I will be beginning the next book in the series and will likely read all three back to back. Steven Pinker’s The Blank Slate centers on the age-old argument of nature verses nurture. This book presents the argument that both factors play a major part in the makeup of individuals. Along the way, the author takes on what he contends is a pervasive but invalid view that most human behavior is based upon culture and has almost nothing to do with biological evolution. First, the book sets out to prove the point that biological evolution impacts human behavior in a major way. Pinker outlines how human violence, cooperation, family structure, sexuality and many other aspects of human behavior all have their origins in survival strategies and thus evolution. Next, the author sets out to highlight how, throughout the twentieth century and even earlier, various scientists, political movements and ideologies have advocated a counter narrative. That alternate interpretation is that individuals and society are one hundred percent malleable and can adopt any patterns or customs based entirely upon the environment, particularly culture. Thus, the term “The Blank Slate” is the book’s title. Pinker tries to paint a picture of the social sciences, political and social movements, etc. that are dominated by folks hostile to the idea that human evolution has had a great impact upon our culture. He attributes much of this resistance to political and social motives that have overridden the scientific method and rational thinking. 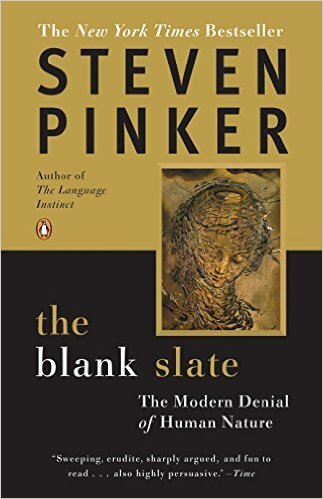 Pinker highlights some of our worst policies and social theories propagated by both the political Right and Left to be based on the Black Slate. He argues that many pernicious ideologies, including Nazism and Communism, are based on it. He contends that at the core of these thought systems is the belief that the human mind is infinitely malleable. Pinker spends a lot of time addressing how certain scientists have perpetuated this myth. He is particularly critical of the many who have done so for reasons that he contends are political. He also highlights the unfair attacks on scientists and philosophers who have tried to argue that many human differences as well as activity stem from biology. The author also describes how certain scientists who advocated for the validity of a biological evolutionary view have been unfairly and outrageously stigmatized as racists and Nazi sympathizers. Finally, the author argues against what he contends is the false assertion that biological causes of human behavior will allow folks to somehow excuse immoral acts. He makes a strong defense of morality in a world where morality is part of our genetic makeup. Pinker is very fair. He takes both the political and cultural Right and Left to task for what he contends is untenable denial of the genetic origins of behavior. He points out that, ideologically, both sides have expended a lot of energy in pushing the validity idea of the Blank Slate to the detriment of society. I am very much with Pinker on his view of human behavior being influenced by evolutionary biology. It seems clear for anyone who has studied evolution and human behavior that human personality and actions are the result of a combination of nature and nature. A lot of our culture as well as the things that humans do can be linked to survival strategies that humans evolved with. I also agree with him that such conclusions in no way invalidate the value of ethics, morality and decency. However, as Rachel of Hibernator's Library points out here, one question arises: does Pinker overstate how much resistance there has been to this balanced view of human nature? Many books, articles and popular opinions seem to support the notion that we are a combination of nature and nature. Perhaps Pinker is trying a little too hard to prove this point. Yet, Pinker has a point that we have a lot of ideologies, as well as scientific thought, that seems to deny any connection between biology and behavior. Furthermore, in recent decades, unfair and slanderous attacks have been conducted on proponents of the theory of biological factors driving behavior. Having read Pinker’s The Better Angels of Our Nature, I can describe that book as a kind of follow up to this one. In it, the author outlines how certain human characteristics that have roots in human evolution are expressing themselves more and more as society progresses. Positive behavioral traits such as cooperation, empathy, nonviolence, etc. are winning out as societies throughout the world change. My commentary on that book is here. This book is full of ideas. Though I have some disagreements with him, I find that Pinker’s view of humanity is very close to my own. I believe that this is one of the books that is important for anyone who wants to understand humanity and our cultures. It helps us understand who we are and why we are the way we are. I highly recommend it for folks who are curious about these subjects.